Looking at things on the bright side, if you're the only human being on an entire planet, you've got an awful lot of elbow room. On the downside, though, if even the tiniest thing goes wrong, you could suddenly be up that well-known tributary without a paddle. Mark Watney was part of a six-person crew that constituted the third manned expedition to Mars. The mission was to remain on the Red Planet for thirty-one days, but six days into their stay, a huge dust storm blew up with ferocious winds that forced the crew to abandon the mission. As they're racing toward the MAV (Mars Ascent Vehicle) that will take them back to the safety of their orbiting space ship, a long, thin antennae blows free and slams into Watney, piercing his space suit and wounding him. The crew is moments away from disaster but searches through the swirling dust in an effort to find him. Unhappily, the antennae has also pierced his bio-monitor computer, which now flatlines. Watney's bio-monitor computer is networked to those of all the other crew members who see the data and draw the obvious conclusion. Out of time, and perilously close to losing their own lives, the mission commander has no choice other than to abandon the search for Watney's body. She orders the crew to race to the MAV and the remaining five crew members make a very close escape, reluctantly leaving behind the body of Mark Watney, the first human being to die on the planet Mars. Those NASA guys make great space suits and Watney's functions exactly as it should have under these circumstances, saving his life and allowing him to live another day. Some minutes later, he recovers consciousness and discovers his fate. His first conclusion is the obvious one: he's screwed big-time. He's alone on Mars, and while he does have the crew's living quarters which survived the storm, it's designed to last for thirty-one days. He has a limited amount of oxygen and water and enough food to last three hundred days, if he rations it carefully. That's the good news. The bad news is that the next manned mission to Mars is four years away and will be landing way the hell and gone away from the site assigned to Watney's expedition. Additionally, he has no way of communicating either with NASA or with the crew that left him behind. So yup; he's pretty much screwed. But Watney is a very clever and resourceful guy. He was the mission's botanist and engineer, and he refuses to accept the inevitable. He gets down to work, determined that he will not be the first person to die on Mars if there's any possible way of avoiding it. In the process, he begins a journal, detailing his efforts to survive, and the journal constitutes the bulk of this book. 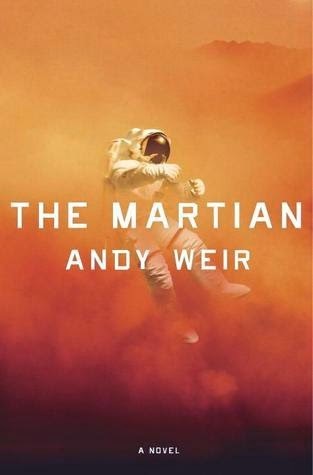 Though a nerd at heart, Watney is also irreverent, funny and mischievous, and thus turns what might have been a dull, technical treatise into a gripping read. His story is part Apollo 13, part Castaway and a helluva ride. The beauty of the book, which is set in the not too-far-distant future, is that it all makes sense and seems perfectly believable. This is not the science-fiction of Star Trek or even of Arthur C. Clark; rather it's a tale of one man's gritty effort to survive under impossible circumstances that would defeat anyone of lesser spirit. A special shout-out goes to my friend Kemper. This is not the sort of book I would have ever found on my own, but he wrote such an intriguing review that I not only ordered it immediately, but read it the second it hit my mailbox, rather than letting it sit on my books-to-read stack for months on end. So thanks for that, Mr. K. While I have a couple of minor qualms about the book, I enjoyed the hell out of it and it's an easy 4.5 stars for me.